NEW YORK, July 13, 2018 /PRNewswire/ -- Concierge Auctions has unveiled its July/August lineup of 24 real estate opportunities spanning four countries and 11 U.S. states, including its first annual Summer Mountain collection of eight premier mountain offerings, the majority of which will sell Without Reserve. Featured properties include a 244-acre ranch in Aspen, Colorado; a chateau near Whistler Village in Canada; and a single-story family log home in Lake Tahoe, Nevada, previously owned by business magnate Howard Hughes. Bidding for these properties will be hosted via the Concierge Auctions' online marketplace, conciergeauctions.com, allowing prospective buyers to participate in real-time from anywhere in the world. Circle R Ranch is a 244-acre property located in the Woody Creek Valley of Aspen, previously listed for $59.5 million. Comprised of 22,165 square feet, the ranch includes 10 homesites with six single-family homes that offer a combined 22 bedrooms and 23 bathrooms — each with their own mountain contemporary design featuring large, eat-in kitchens and updated appliances. Additional property features include historic cabins, storage facilities, agricultural buildings and barns, all of which provide the infrastructure to develop a family compound. The property also includes a swimming pool, stables and facilities for horses, a private evergreen farm, an outdoor entertaining space by the river, tennis court, underground lawn sprinkler, ponds, and a playground with swing set and slides. The city of Aspen offers four world-class mountains for skiing, hiking and biking, as well as fly fishing, and whitewater rafting. 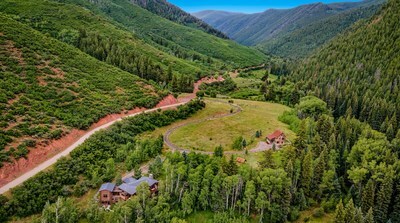 Circle R Ranch will Sell At or Above $10 million in cooperation with Andrew Ernemann and Craig Morris of Aspen Snowmass Sotheby's International Realty. "The Circle R Ranch is an impressive offering surrounded by National Forest Service property on three sides. It has nice proximity to Aspen/Snowmass, yet while one is at the Ranch it feels worlds away," stated Ernemann. "It's rare in Aspen to find a property suitable for a family compound. Not only does the Circle R Ranch check that box, it also boasts several homes built to the highest quality, trout ponds, water rights, a great barn and so much more. We are excited to have Concierge Auctions marketing the property with us and since announcing the auction, the buzz has been impressive." Previously listed for $25.9 million CAD, Chateau du Lac is a stone chateau set on more than five acres, providing a total of 10,000 square feet of indoor/outdoor living space. The estate includes five bedrooms; a French country gourmet chef's kitchen; a master bathroom with fireplace, custom built-ins, steam shower, large soaking tub, French doors, and access to a lakefront balcony; two-story foyer and dining room; formal main floor study/library with fireplace; home theater; second floor sitting room with lakefront balcony; a self-contained, one-bedroom guest suite with fireplace, full-equipped kitchenette, laundry room, and private entrance; a coach house above a two-car garage that consists of a studio with loft king bedroom, kitchenette, and living/dining room; an expansive cantilevered stone terrace equipped with a hot tub and barbecue grill; a second floor balcony; and two attached garages, the smaller of which is converted into a gym. With 1,000 feet of lake frontage (approximately one-fifth of the lake), the property offers an abundance of activities including paddle boarding, kayaking, fly fishing, swimming, river rafting, and ice skating/hockey in the winter. Additionally, the estate has easy access to three signature golf courses — Arnold Palmer, Robert Trent Jones, and Jack Nicklaus — and is located in a top ski destination in North America, known for the Whistler and Blackcomb dual mountains and its 5,200-foot vertical ski drop. "Imagine five private acres of majestic forest, hugging 1,000 feet of shoreline on one of Whistler's most pristine residential lakes," states Lindsay Lambert, who is selling the home along with her husband, Keith. "The magnificent estate is nothing short of extraordinary, with over 10,000 square feet of inviting living space, indoor and out. It embraces and welcomes a four-season lifestyle and is fabulous for entertaining. It is nothing short of magical. The auction process is opening the door for others to fall in love with it." The property is selling Without Reserve in cooperation with Maggi Thornhill of Thornhill Real Estate Group. "Apart from the obvious superb quality and extreme privacy this home offers, imagine the convenience of being just minutes away from gondola access to Whistler Mountain in the winter and mountain biking and hiking in the summer," Thornhill said. "This is a rare opportunity to own in such a spectacular Whistler location, and now prospective buyers can do so at their own bid price." Previously owned by business magnate Howard Hughes, Summertide is a single-story, family log home located in the north shore of Lake Tahoe. Envisioned by Kelly & Stone Architects, Agan Consulting Corporation, and Brink Custom Homes in 1934, and comprised of 2,518 square feet, the five-bedroom home overlooks 500 feet of shoreline and includes a gated entrance with detached four-car garage; floor-to-ceiling windows; an open floor plan with dining and living rooms combined; grand bedrooms; balcony access; an impressive foyer; and a private study. Interior details include vaulted, beamed ceilings, a stone fireplace, and exquisite wood and stone details. Additionally, the property has a two-bedroom guest house cottage added in 1940 offering an additional 1,200+ square feet of living space. "We moved to Nevada nearly 25 years ago and purchased Summertide — perhaps Nevada's most historic home — from the Howard Hughes Company. Nestled in a forest of magnificent pine, cedar and fir trees on a bluff overlooking Lake Tahoe, the main house is a beautifully crafted traditional Western log cabin, which we carefully brought up to modern standards," stated the seller, Bruce James. "Between the cabin and our cottage on the lake, we can sleep 20, which we just did over Fourth of July week. We're confident the auction process will identify the right new owners who will enjoy the home as much as my family and I have. It's a special place." Previously listed for $17.5 million, the furnished estate and its guest house cottage will Sell Separately or Collectively Without Reserve in cooperation with Mary Jurkonis and Nancy Fennell of Dickson Realty. "We are honored to be involved in the marketing and sale of one of the last iconic lakefront properties for sale in this area. Especially this property, which has it all: history, location and development opportunities," stated Fennell. "Working with Concierge Auctions has been a pleasure. It's an educational experience witnessing their marketing reach and collaborating with such a world-class marketing group to help our clients reach their goal in an efficient and effective manner." Overlooking the city of Los Angeles at the crest of Palos Verdes Peninsula in the guard-gated city of Rolling Hills, the 51,000-square-foot estate known as "Hacienda de la Paz" is the only residence in the Americas designed by award-winning Spanish architect Rafael Manzano Martos, curator to Spain's royal family. Boasting nine bedrooms, 25 bathrooms, a grand neoclassical ballroom and an indoor tennis court, the awe-inspiring estate — originally listed for $53 million — will sell Without Reserve in cooperation with Jade Mills of Coldwell Banker Residential Real Estate and Jason Oppenheim of The Oppenheim Group. "This estate would be almost impossible to reproduce today, even if someone had the passion to attempt it, as it would likely take almost a decade and cost more than $100 million," Oppenheim stated. "Hacienda de la Paz is one of the most unique and meticulously crafted properties in the United States." Hacienda de la Paz uniquely showcases three distinct periods of Spanish history and architecture on one site; the 19th century Hacienda including Moorish gardens, an 18th century Neoclassical grand ballroom; and its 10th century Moorish hamam spa. Property features are boundless and also include an indoor pool; a Renaissance inspired, hand painted chapel; an English library styled after a 19th century gentleman's club with flooring crafted from 800-year-old river recovered logs; a gym; yoga room; wine cellar and various catering facilities. "My dream was to build an architectural tribute to California, a legacy property in the style of the original Getty Villa or Hearst Castle," stated the seller, John Z. Blazevich. "I recruited a team of skilled architects, interior designers, craftsmen and artisans from around the world to assist me in creating an authentic first-generation Spanish hacienda. I built a rare work of art, therefore selling in this manner as you would a Picasso makes sense to me." Brooks Venice offers four modern, free-standing properties with smart home technology and eco-friendly design. Currently listed for a combined $9.99 million, the properties will sell collectively or the model unit, 742 Brooks Avenue, individually in cooperation with Kerry Ann Sullivan of Halton Pardee and Partners, Inc.
Each home is comprised of 2,200 square feet and includes four bedrooms; a chef's kitchen with European-style cabinetry; full-level master suite with spa bath, floating double vanity, freestanding soaking tub, and custom dressing room and walk-in closet; and a garage with accessory dwelling. Interior details include floor-to-ceiling windows, a floating staircase, wood feature wall, Calimbamboo® and concrete flooring, skylights, and clerestory windows. Outdoors, each home has bi-fold doors that lead into the backyard, a second-floor balcony, its own driveway and walkway, and a rooftop lounge with views of the city and marina. Striving for LEED Gold certification, tech and eco-friendly features include ring doorbells; Lutron smartphone-controlled lighting and garage door; Nest thermostats; tankless water heaters; and rainwater collection system. The 36th floor residence in Miami's renowned Porsche Design Tower — a rare offering that includes a robotic car elevator that brings its residents up to their own private sky garage — includes three bedrooms, five bathrooms and a personal oversized terrace overlooking the ocean. Along with the three-story lobby with a glass car observatory, the residence features glass entry/exit rooms for automobile transfer to the car elevator. Located on Sunny Isles Beach with 200 feet of sugar-sand ocean frontage, the Porsche Design Tower offers five-star service and amenities, security, and an oceanfront-entertaining oasis. Building features include 24-hour valet service; yoga and massage rooms; hair salon; steam, sauna, and ice therapy rooms; fitness center with Milon equipment; Dornbracht Vichi shower; sunset deck with infinity edge pool; movie theater with stadium seating; community room; and an exclusive restaurant and lounge bar with 24-hour security and oceanfront ballroom. Previously listed for $8.9 million, the 4,749-square-foot residence will sell Without Reserve in cooperation with Marc Hameroff of Engel & Völkers Miami. "Porsche Design Tower 3605 is modern luxury at its finest. Interiors designed by world renowned Steven G. and furnishings by Mercedes Benz perfectly complement the most spectacular collection of residences throughout all of Sunny Isles Beach," stated Hameroff. 189 Beaver Dam Road is a custom manor comprised of 7,894 square feet including four bedrooms; two guest suites; a master retreat; a chef's kitchen; workspace; separate formal dining room that seats more than 12; a climate-controlled wine room; and finished attic with custom closets. Custom interior details include black walnut and oak flooring, three fireplaces, Marvin windows and doors, a custom mahogany front door, a custom-crafted library, and oak paneling and cabinetry. Set on four acres, the estate offers several outdoor amenities including a putting and chipping green in the backyard; Viking built-in barbecue; spacious stone patios; an outdoor entertaining area; Al fresco dining; and a multi-purpose outbuilding. Previously listed for $2.695 million, the property will sell in cooperation with Diane Tynan of Coldwell Banker. Offering a private lakefront setting, 91 Old Corner Road is a contemporary, six-bedroom estate situated on 4.45 acres. Featuring a chef's kitchen with a large quartz island and custom cabinetry, and a sun-filled master retreat with a marble bath and soaking tub, interior features include soaring ceilings, hardwood floors, walls of glass and a fireplace. Outdoor amenities include a private, gated driveway; a wraparound deck; covered terrace; second-floor patio; pool; Har-Tru tennis court; and a three-car attached garage. The 6,042-square-foot property was previously listed at $3.795 million and will sell in cooperation with Diane Tynan and Candice Stafford Coldwell Banker. Built in 1748 and renovated in 1993 and again in 2005, the 7,375-square-foot home in Briarcliff Manor includes six bedrooms; a grand living room with French doors leading to the backyard; ample natural light; river views from almost every room; patios; a Juliet balcony; gourmet eat-in kitchen; a formal dining room that seats 16; master suite with a bubble massage tub, separate tiled tub, and heated floor; exercise room; wine cellar; upstairs great room; and a library/home office. Rich interior details include hardwood and marble floors, high ceilings, a grand foyer, and several fireplaces and chandeliers. Outdoors, the property features a colonial structure with a wooden exterior, a professionally landscaped lawn, sprinkler system, and gardens. Previously listed for $1.865 million, the property offers sweeping views of the Hudson River and Palisades, and will sell in cooperation with Justine Flanagan of Houlihan Lawrence. In cooperation with Edd Geoffroy of Angel Fire Homes, LLC. and Michael Brown of Avalar Texas Realty. In cooperation with Ric Souto of Slifer Smith & Frampton Real Estate. In cooperation with David Baldinger, Jr. of Steamboat Sotheby's International Realty. Currently Listed for $3.55 million. Selling At or Above $2 million. In cooperation with Lisa Olson of Steamboat Sotheby's International Realty. Previously Listed for $1.6 million. Selling Without Reserve. Previously Listed for $1.15 million. Selling Without Reserve. In cooperation with Gemma Bruce of Casa & Country's UK. Originally Listed for €3 million. Selling Without Reserve. In cooperation with Debi Benoit of Benoit Mizner Simon and Co. Real Estate. Previously Listed for $6.7 million. Selling Without Reserve. In cooperation with Tammi Brooks of Inhabit Real Estate. Previously Listed for $3.15 million. Selling Without Reserve. In cooperation with Donna Eide of Berkshire Hathaway HomeServices. Previously Listed for $3.2 million. Selling At or Above $1.5 million. In cooperation with Adriana Benedetti of Umbrian Property. Currently Listed for €1.95 million. Selling Without Reserve. In cooperation with Brad Rellinger of Harbor Sotheby's International Realty. Previously Listed for $5.995 million. Selling Without Reserve. In cooperation with Kathy D. Koehler of Reece Nichols Realtors. Previously Listed for $2.39 million. Selling Without Reserve. In cooperation with Kathy Ellis of Coldwell Banker Residential Brokerage Company. Previously Listed for $3.8 million. Selling At or Above $2.9 million. In cooperation with Terri and Bill Rupp of Engel & Völkers Hilton Head Island. Previously Listed for $4.245 million. Selling Without Reserve. In cooperation with Valérie Prélaz of Naef Prestige – Knight Frank. Previously Listed for CHF18 million. Selling Without Reserve. As part of Concierge Auctions' Key for Key® giving program in partnership with Giveback Homes, each sale will result in a new home built for a family in need. To view all properties, visit ConciergeAuctions.com or for more information, call +1.212.202.2940. Concierge Auctions offers commissions to listing and buying real estate agents. See Auction Terms and Conditions for full details.